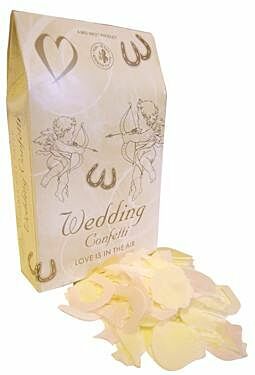 Celebrate a wedding in style with this handy size box of wedding confetti. Made from biodegradable rice paper which is perfect for on the day and will not harm the environment. With pink and cream shapes of hearts, horseshoes, wedding bells, bows and much more this dellightful box will truly add to the atmospheric celebration. Love truly is in the air. A perfect little extra when buying a gift for that special couple.